Mashed potatoes, cheese and bacon...what can be better? I'm not sure there is anything better, at least not for a quick and easy side dish or appetizer. 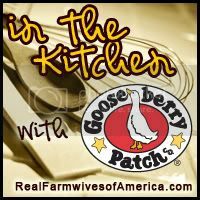 This recipe that I'm sharing as the third from Gooseberry Patch's Christmas Kitchen cookbook (part of the Real Farmwives - and Friends - of America's in the Kitchen series) would be perfect for the leftover mashed potatoes from your big family Thanksgiving or Christmas dinners. It's also another recipe with less than 5 ingredients...ONLY 3 ingredients. Score. Start with mashed potatoes (4 oz. package of instant), prepared and cooled. Stir in a half cup of shredded cheese - I used Colby & Monterey Jack blend. Pour a half cup of bacon bits into a separate bowl. I used my cookie scoop to measure and then roll out 1-1/2 inch balls of potatoes. Then I rolled them in bacon bits. Yum, bacon! Then I placed them on an ungreased cookie sheet (I covered mine in parchment paper because I HATE dishes) and bake at 375 degrees for 15 to 18 minutes. Prepare instant potatoes according to package directions; let cool. Stir in cheese; roll into 1-1/2 inch balls. Roll balls in bacon bits; arrange on an ungreased baking sheet. Bake at 375 degrees for 15 to 18 minutes . Serves 4. This looks delicious and so easy. I could eat those for breakfast! I'm making extra mashed potatoes next time--just so I can put the left-overs to use! love potatoes these sound good.